Votes don’t get any bigger than the one on Obamacare Repeal and Replace in the House of Representatives next week. After winning over a dozen or so conservatives this morning the Trump team feels good enough to bring it to the floor. A whole hell of a lot is riding on this vote, and I expect all the stops to be pulled, and narrow passage. The alternative is too bleak to think about. Three and a half years ago freshman Senator Ted Cruz convinced these same conservative House members to shut down the government rather than fund Obamacare. This time around, as a Trump team member, he’ll be coaxing them aboard, as will every other sane conservative. There’s a whole hell of a lot not to like in this bill, but it’s way better than no bill at all. Conservative Republicans who vote no on this bill are posturing, and it won’t play well. Trump may be no conservative, but he’s all we’ve got, and to torpedo his administration, right out of the gate, is nuts. He has the potential to do great things for conservatism. Look at his budget, and Neil Gorsuch. The Senate will be another story, and here we’re going to see if Trump really has what it takes. I’m hopeful, but it will probably take some real hardball. With Sen. Lisa Murkowski, for example. She only masquerades as a Republican in order to get elected, so she has no loyalty to the Party or anyone in it. As the most liberal member of the Republican Senate Caucus, she is not inclined to vote for Obamacare R & R. But she has a weakness. She’s from Alaska. Alaska is in absolutely terrible shape right now. The situation would look desperate, except for the fact that the State has a $50 billion savings account in Jay Hammond’s Permanent Fund. At the rate the State of Alaska is spending money they’ll blow through the whole thing in the next fifteen years. Alaska has one hope, resource development. On federal land. Thanks to some tax incentives provided by previous State Legislatures, the oil companies, mainly independents, are finding a lot of oil near previously discovered fields. It will help. But what Alaska really needs is a very aggressive policy for oil exploration and development on federal land, most especially ANWR. President Trump and Interior Secretary Zinke are in a position to help Alaska out of the hole that it’s in. It would be doing the state a great favor. Does Lisa Murkowski want the Trump administration to be nice to Alaska? Then maybe she should be nice to the Trump administration. It’s not a Democrat/Republican thing. Alaska needs help, and hope, desperately. I suspect Murkowski will see the light. Other Senators have other vulnerabilities. The federal government has its fingers in everything, from the IRS to the Postal Service. Senators have contributors. 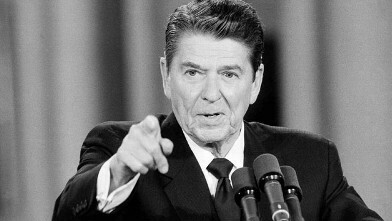 Here’s an example from the good old days with the Gipper. In 1981 he needed Democrats in the House to pass his massive tax cut, and Louisiana’s John Breaux was a leader of the bloc of Southerners he needed. John Breaux was a wholly owned subsidiary of the sugar industry, and he demanded, and got, special tax breaks extended. It was pure pork, at its absolute worst, making American consumers pay artificially high priced sugar, but that’s what he wanted, and that’s what he got. It’s too bad Trump doesn’t read, although I see he was trying to read up on Andrew Jackson. He should read Robert Caro’s Master of the Senate. Trump says he’s the master at the art of the deal. But deals are done differently in Washington than they are in New York. If Trump can play the game like Lyndon Johnson did, he’ll get a lot done. My God, what a nightmare for the left. A conservative LBJ. Maybe that’s what we’ve had all along.